These summer camp programs are designed for students ages 14 to 18 years of age, and those entering 9th, 10th, 11th, or 12th grade in the Fall. Looking to plan your own high school youth camp for a group of 6 or more people? Check out our Camps & Retreats for Groups. We provide the fun, the friends, and the adventure to open doors for positive change. Rock-N-Water Christian Camps is located in Northern California. We offer a variety of youth camps for high school students. Each program is specifically geared towards individuals looking to grow in their Christian faith. Teens can come to our sleepaway camp on their own or with a group of friends. In addition to the amazing amounts of fun and adventure, youth will find ample opportunity to make new friends. Rock-N-Water is a group of Christians who want to impact young people with the joy of God’s Living Word. We hope they might come to know Jesus and pass on God’s love with excitement. We focus our summer programs on biblical principles. Secondly, we use the help of nature, friendship, and challenge on our overnight camps to develop character. Learn more about Rock-N-Water Christian Camps. Bring a friend! It’s fun to make new friends at camp but it’s also rewarding to strengthen those friendships you already have by going to a sleepaway camp together. 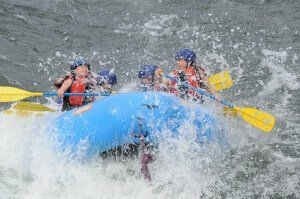 Contact us so we can explain what to expect and how to prepare for an adventure camp. Incoming 9th grade students can choose between our High School program or our Middle School/Jr High School program. Six people is all that it takes for you to be able to throw together your very own, fully customized, camp program. So gather together some friends and/or family. You can pick and choose exactly what dates you want (space permitting of course), the adventures, and when you arrive and depart. We’ll take care of everything else, from the food to the campfire to the amazing staff that lead all of our high school programs. Learn more about creating your own trip. Finally, for more information on our Christian youth camps near you, and our overnight high School summer camps, please contact us. We’d love to answer any questions that you might have about our overnight programs and summer programs for high school students.